Last week, I made my most satisfied cake by far. It was a cake to be done in pastel colours, which suited me perfectly, since I usually am rather light-handed when adding colours to my cakes and am not used to making dark coloured ones. 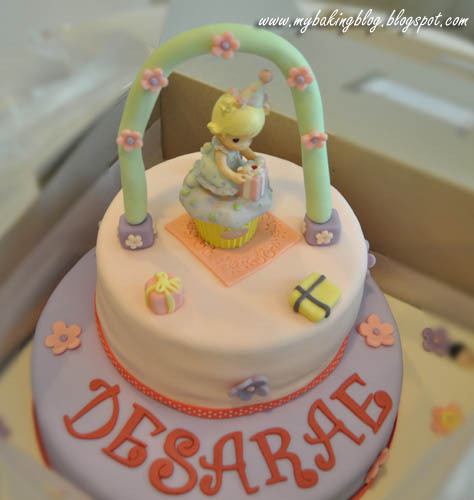 Desarae's mum had a Precious Moments topper ready to add on to the cake and she also liked to have an arch and ribbon on the cake. Initially I made an arch with pastel pink and green fondant. It was a little like a braid. It was nice and sweet looking, I like it. 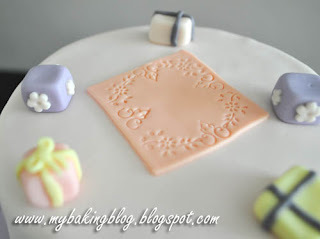 Unfortunately, the fondant could not dry totally (it kept raining and was humid). I was afraid it would not be able to stay upright. So the day before the cake was needed, I made another one, with gumpaste. This time, no braid, just a single long piece of pastel green fondant. I stuck flower wire in it to make it stay in shape. The top tier was a carrot cake and the bottom tier a chocolate fudge cake with ganache. 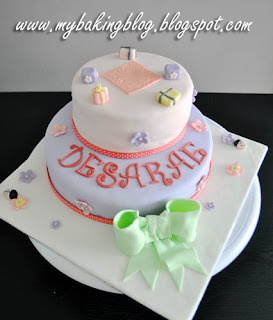 This is also the first time I bake both cakes and decorate them all within the same day. I usually split them into 2 days. Though I am pleased, I have to practise making more my cakes more flat. They tend to slope a little and this isn't so nice for doweling.